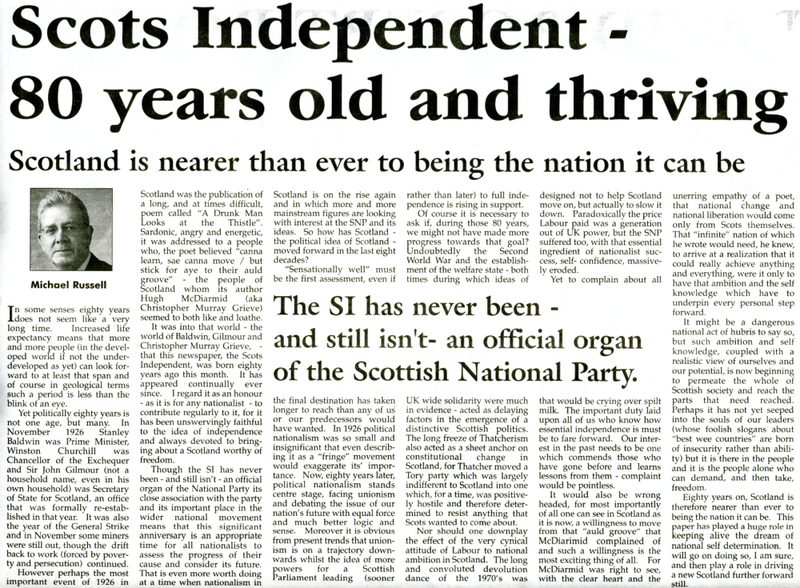 As the Scots Independent celebrates its 80th birthday I thought I'd include a few articles from this issue for you to read here. Around six years ago as I was building the Electric Scotland web site I was keen to try and get some regular articles about the Scotland of today and contacted all the Scottish newspapers and political parties. Out of all of them only the Scots Independent Newspaper was interesting in doing something on the web. When I asked who bank rolled them they all fell about laughing :-) You see it is truly an independent organization and at the time I think they only had around £3,000 in the bank and all of their staff were volunteers. 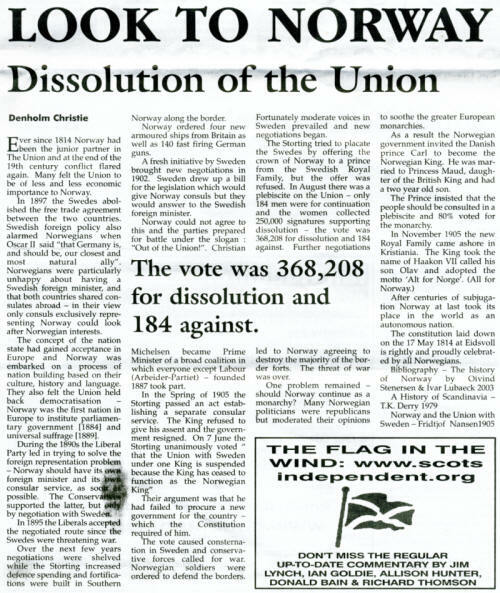 Well together we created The Flag in the Wind which now has more online readers than the newspaper does and has created not only an increasing interest in nationalism but has also contributed hugely to the cultural side of Scotland. Peter Wright, the then chairman of the newspaper, took great interest in the cultural section and from him and his wife Marilyn they have produced an outstanding audio treat of thousands of Scottish words and poems. Every week you also get his recipes, Scots Wit, Famous Quotations, poems and the Scots language. Jim Lynch, board member of the newspaper and currently the editor took great interest in the Political section and really made it his own by adding not only commentary on things to do with Independence but also created the Synopsis section and Foot in the Mouth Notes. Over time Jim managed to bring on others to help with the weekly newsletter with Richard Thompson, Allison Hunter, Ian Goldie being the first to join in but now also Donald Bain. This ensures we get a cross section of views. The newspaper is a separate publication from "The Flag" and I for one would love to see these issues going on line as there are many interesting articles in it and it really is a great read each month. You might want to subscribe to it and if so Click here if you wish to subscribe to the newspaper by credit card. Since 1983 the SI has honoured a Scot each year with an award named after the late W Oliver Brown who over many decades contributed a pithy column which was the first item read by many SI devotees. The "Oliver" was first awarded to the author and climber Tom Weir and is now regarded as the Scottish equivalent of the "Brits" so-called honours list. The roll call of winners indeed does read as a list of outstanding Scots. 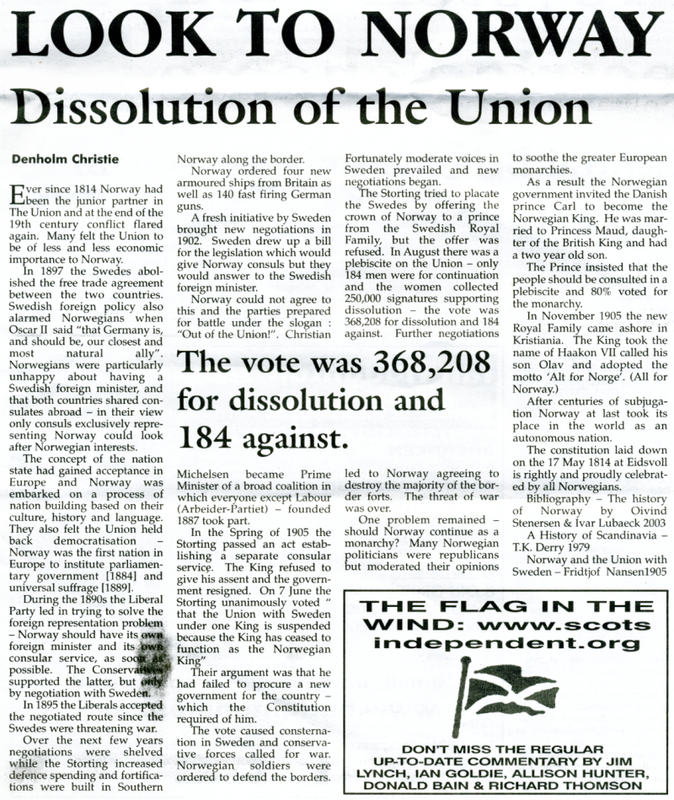 Over the years Electric Scotland has been the happy recipient of a number of publications for our pages including Scotland - A Concise History which is an excellent concise history of Scotland coming from one of Scotland's most respected historians, James Halliday, who is now the current chairman of the newspaper. 'A masterly summary of our national story by an impeccable authority', - The Scots Magazine. 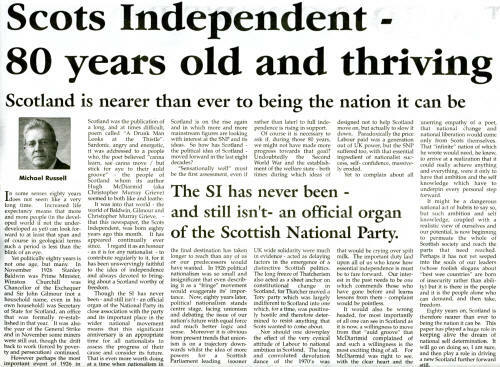 And so one way or another the Scots Independent has done a great job in promoting the cause of Scots Independence for 80 years and we'd like to wish them a very Happy Birthday!